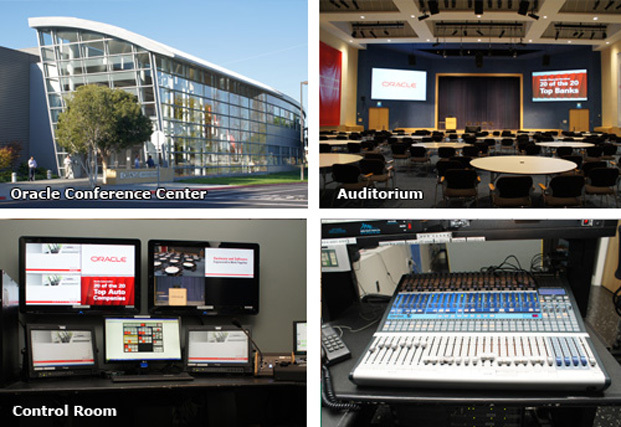 When Oracle upgraded their television production facility to HD, they also decided to upgrade their auditorium presentation systems to HD at the same time. AV-integrators was chosen to design and build this project just as we completed the Oracle television studio. The auditorium system required replacing the projection screens with Digital Projection Titan 1080P 3-DLP HD projectors. The audio system was upgraded to a 5.1 surround cabability and it is controlled by a Presonus StudioLive digital audio mixer. The video system required tight integration with the Oracle’s television production studio via HD-SDI. disk recorders, and a Utah Scientific router. A custom Crestron touchscreen system was designed to control the switching of signals to the projectors and to the television studio.